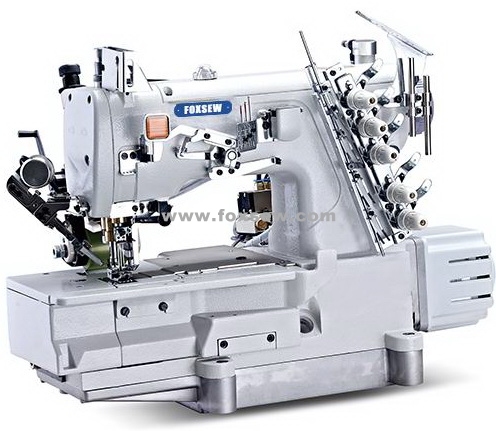 (1) Cover seaming with adjustable folder, movable presser foot, extend bigger range of sewing items. (2) Auto trimming with new design of upper thread holder, trimming precisely and wiring stably. (3) New design of built-inset synchronizer, makes position rescisely and stably, easy to adjust. accessories to suit for different work. 2) New type needle bar oil-back system, no possibility of oil leakage. 3) Needle bar transmission structure, adopt all-sealed design, more safe and easier to keep clean. 5) Some key parts are imported from Japan, which enhance the wear-resistance of the machine. trimmer device and foot lifter device. 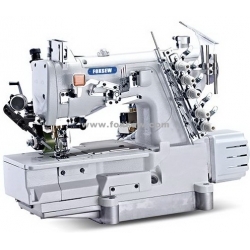 Easy to operate, can improve the quality and efficiency of sewing work. equipped the rear puller, when sewing the blanket and super heavy materials.